Will the European plane maker ever manufacture a freighter version of the double-decker Airbus A380 as originally intended and offensively propagated a decade ago? All construction plans for this type have been put on the back burner due to sluggish market demand. But the big aircraft could become a P2F conversion candidate. No orders, no demand. This brings up the question if the A380F will be cleared from the Airbus books once and for all. “No, this won’t happen,” assures the plane maker’s Sales Chief John Leahy when asked by CargoForwarder Global about the program’s fate. No orders, no demand. This brings up the question if the A380F will be cleared from the Airbus books once and for all. “No, this won’t happen,” assures the plane maker’s Sales Chief John Leahy when asked by CargoForwarder Global about the program’s fate. According to the manager, it’s not a fly or die situation, the A380F is facing. Although Leahy admits that Airbus is currently not taking any sales initiatives to get the big freighter into the air in the nearer future, because of little to no demand by airlines for uplift capacity of roughly 150 tons per flight. Leahy holds that Airbus is constantly monitoring the global market to be ready in case the situation should change with the A380F variant eventually getting a new perspective. The manufacturer’s speaker Heiko Stolzke confirms that the construction plans are still in the drawer although they had become somewhat dusty. “We could start building the freighter version of the A380 right away, if needed,” he states. Airbus CEO Tom Enders belongs to the optimists, believing that there will be A380 freighters flying sometime in the future. 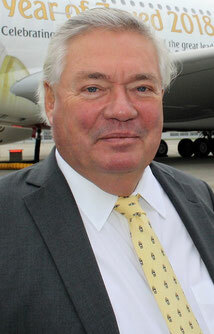 “But only as P2F conversions after the first generation of passenger A380s have been taken out of service due to age reasons,” states Enders who is nicknamed ‘Major Tom’ due to his former rank in the German Army. 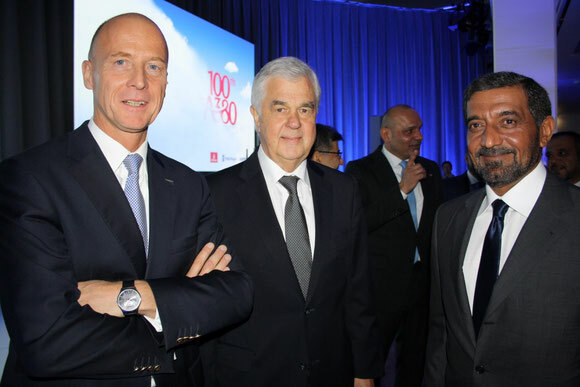 The fate of the freighter model was discussed last Friday on the sidelines of the 100th A380 (passenger jet) delivery to Emirates at the European plane maker’s Hamburg plant. Vision was the keyword Airbus CEO Tom Enders elaborated on in his remarks. Back in 2008, Emirates got their first A380 out of a large initial order that has meanwhile grown to 142, Enders recalled. It was at a time the world was facing a deep financial and economic crisis. To fill such a huge aircraft with sufficient passengers and cargo in times that markets are flat is not an easy exercise. But Emirates had the vision and also the guts to stick to their original order, offering their customers a completely new flying experience, Enders applauded. At present, Emirates is operating the double-decked jetliner to 48 cities on scheduled services. The carrier has 1,500 cockpit crew and over 23,000 cabin crew specially trained to operate its A380 fleet. However, if it weren’t for the large order of 142 A380s placed by Emirates, the program for the double decker would supposedly have been aborted by Airbus years ago. Currently, there are 101 A380s standing in the order books of the plane maker, including the 42 that Emirates still has to receive. Apparently a very limited number. That’s why the production rate has been downscaled dramatically with only eight A380s being finished each year. Despite the rather critical situation the huge aircraft is facing, CEO Enders is convinced of the positive future of the double decker. 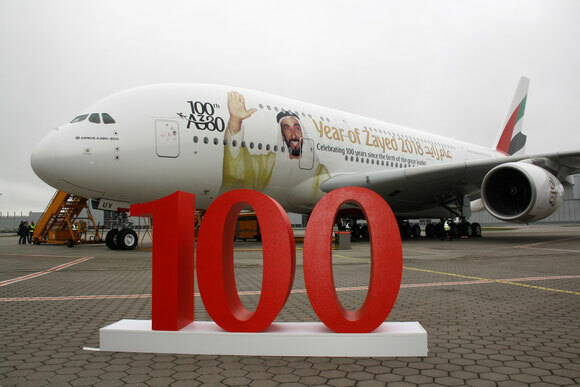 “We will continue building the A380 for the next ten years,” he assured. Addressing John Leahy directly, Enders said that he won’t allow his sales chief to retire, which is planned for 31st December, until he has secured a new large order for the aircraft. Will flydubai become a new A380 operator? There are indications that this could happen at the upcoming Dubai Air Show that runs from 12-16h November. Sheikh Ahmed confirmed that Emirates intends buying more Airbus aircraft, but didn’t specify the models and if this includes signing new contracts for additional A380s. Asked by CargoForwarder Global if Emirates’ partner airline flydubai might be a potential A380 operator, Sheikh Ahmed said with a smile on his lips that he would not exclude this option. Both state-owned Gulf carriers based in Dubai have joined forces last July, announcing an extensive partnership agreement that includes the alignment and optimization of their individual networks.